Although it may feel that The Bone House is a false memory and you are being driven quite mad by the ongoing stop-start, stop-start, stop-start of this project – rest assured dear readers, that the work is clawing its way back from the darkest depths of the back burner and onto the stop-mo table. Puppet fabrication and blocking are the next stages in production, so I aim to bring more updates from the studio over the next few weeks. Above is a still from my initial lighting and set layout tests. Feedback was that although these tests are strong in terms of dramatic composition, the lighting was too ‘primary’, not nearly sickened or putrid enough… And I have to admit, I agree. Oh well, back to the gel kits then! Pleasingly theatrical and atmospheric! And gives a nice hint of ‘fogginess’ (which might be challenging to develop physically/’in camera’ but worth it)? Perhaps more contrast to background silhouettes higher up and ‘murkier’ at the bottom? Maybe more grey-with-a-hint-of-blue night-light/half-light and splashes/points of contrasting yellow light (I think the light/shadow contrast could be more evident with the blue channel desaturated a fair bit)? Some back/edge lighting to the main figure and variation between yellow light, shadow and grey-blue light on him? In this test pic, the yellow light gives a really nice impression of a lantern out of view behind him lighting up the immediate area (and one of the factors that lends that sense of ‘fogginess’?) – yellow edge lighting on the figure (impression of this light source behind him) and grey-blue on the front of the figure could look good and be consistent with the impression of this light behind him OR the yellow lit area could be in front of him rather than behind, with a shadow of his legs/lower body (to give impression of low light source/lantern) cast on close area of set immediately behind him??? Re: colour and change of colour through the piece – I think physical, ‘in camera’ gives a quality that’s less ‘homogenised’ with what people recognise in the language of film (whether or not they recognise themselves recognising it) and so helps the visual feel of film and physical animation to stand out – I imagine eerie greyish with some deliberate splashes of colour (which I think can also add to the sense of depth when colour fades with distance, esp in a gloomy scene) – possibly a combination of tight, selective, controllable lighting of the coloured bits in set, colouring of the set/character/props so that you have limited palette of some more apparent colours that are easily isolated to turn down saturation of in post without affecting the rest of the scene. Lighting/composition – basically what I’m thinking more broadly is ways to set the physical colour and lighting up (through location/direction/intensity/colour of the lights, colour or its absence on the set/characters/props, anything else that works/helps) to make what you have from filming be as friendly as pos to tweaking it in post without the latter being blatantly noticeable or losing the visual character, charm and appeal of a physical process. Agreed regarding ‘murkier to sharper contrast’ from the lower to the upper fields. Actually, in this particular sequence, Mr Bird is standing in a grave – the scene is required to show a cross-section of the environmental ‘stratum’ if that makes sense. Not communicated in this test, I grant you, but that is the final objective with regards to set design. Further lighting tests are required to create the right mix, so I will trial your ideas, many thanks. 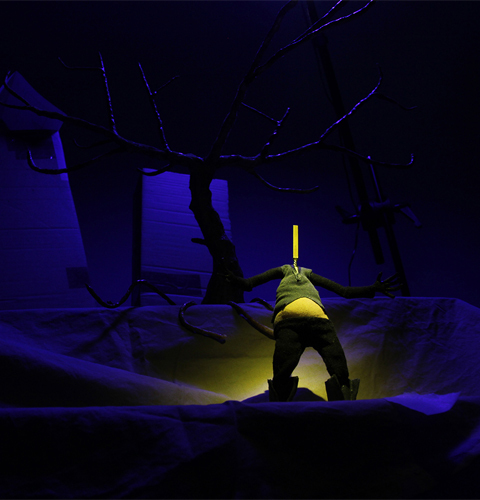 Re: murk and variations in colour saturation/contrast/possibly focus from foreground to background – although the blue looks very blue in this test shot and immediate (personal) impression is to see how that works toned down a bit, the yellow light on the puppet really does make him stand out – it occurs that it’d be more practical to have the light source for this in front of him (in the sense of consistency with set lighting and a visible, on screen ‘light source’/lantern as a point of reference that made sense to viewer, whether this was conscious on their part or not), possibly with subtler grey/blue back/edge lighting, particularly for defining the dark bits of his costume that are on a dark background (as opposed to my previous thought being pretty much the inverse of this, which was grey blue key and fill and yellow edge lighting – I think the original suggestion could be more challenging/problematic)? Also a low light source for the character traditionally looks quite menacing? Re the cross-section/’stratum’ – yes, that makes sense, esp to allow for perspective, camera angle – I guess more of a ‘dropping away/fading’ rather than a literal cross-section of sorts? The latter might look a bit weird? I dunno, would have to think about that more – but maybe appearance of fading into shadow and foreground vignetting where cross section ‘slice’ is (at least for what’s visible in this shot)? What comes to mind is twofold – need to control flicker of the small light(s)/LED(s) for the lantern (and possibly windows in background buildings?) – for a single light, you could just use a variable bench top PSU, for multiple lights running them in parallel from the PSU and combining that with a little bank of inline potentiometers (basically to make a sort of super cheap but effective ‘mini lighting desk’ for the LEDs). For the main lights, if you chose to go with Dragonframe, it includes a lighting sequencer – basically set keyframes for lights’ intensity – that connects through a bridge device to DMX lighting controllers, so you can create flickers, flashes, fades on and off of individual lights… aside from the pots (which are about a quid a pop) the kit is all borrowable when not being used – feel free to check in and sort out if that would be helpful and how to fit in mutually conveniently with your production schedule and time(s) when they won’t be needed by myself. I’ve just had a thought for what it’s worth!… You could always ‘live-action’ the set with the hanging lamp doing its thing, minus Mr Bird. First, the choice to use a traditional model-made environment (i.e. puppets and sets) is a deliberate and early directorial decision. The reason for this is to create clear visual/aesthetic differentiation between the two worlds in the film – the ‘overground world’ of Mr Bird and the ‘underground world’ of The Devil. Pixilation against semi photo-realistic backgrounds is the main stop-frame device that will be used to convey the underground environment, whereas marionettes against model-made sets will be the main stop-frame device for the overground environment. Further, in terms of production, it is not necessarily quicker, easier or cheaper to use live-action or full-size sets and props, especially considering the production stage we are currently at (i.e. past pre-production planning.) First, a large green screen studio space would need to be organised, and our budget for this type of production was spent last year on the underground pixilation sequences. Although it might be possible to arrange for a studio of this capacity/facility via other means, there are no absolute guarantees that this could or would be available, especially if a significant amount of time was required in the space (i.e. more than a day shoot.) It could therefore provide a substantial risk to the production overall, which, as its director/producer and ‘risk manager’, I am not prepared to take. Second, as mentioned above, every scene in the overground environment would be required to have this treatment. This would have a heavy impact on the pre-production planning that has already been worked out as it could mean rethinking certain sequences in their entirety. For example, proposed camera approaches, such as long downward pans, would only be achievable with a crane. Although this is not necessarily a show-stopper, it does indicate that the pre-production materials and subsequent strategies that have already been worked through would have to be binned and re-considered from scratch. Again, this represents a considerable amount of work, which will impact on the production schedule. Also, it would be a great shame to loose the filmic camera movements that could be achieved in a model-made environment or to ‘fake’ these in post-production with software tools such as After Effects, which can only provide a certain degree of emulation in this regard. Additionally, the pixilated underground environment will use such techniques (but planned within the scope of what After Effects can deliver well) so again, there will be less differentiation between the worlds in terms of their production ‘qualities’. Third, the problem arises of what items are required to be full-size, real props/set pieces and how to treat other items that cannot fall into this category for practical reasons. It is logical to consider that all foreground items would be full-size. However, anything that the puppets interact with would be still required to be miniatures (wheelbarrows, spades, body-parts, corpses, etc.) Likewise, large background items (trees, gravestones, houses, the moon) would also still be required as either miniatures or illustrations. So when sub-divided in this way, there is some question as to exactly what would be full-sized/live action, how this would run as a continuous aesthetic thread throughout these scenes and, practically, how this can be effectively knitted together as a single, cohesive environment in post-production. I have seen some very successful productions that use this multi-dimensional approach, but this was a clear directorial choice made at the beginning of the project and therefore pre-production was in consideration of this from the outset. You will also note that a great deal of model/2D production AND a significant amount of post-production is still needed, so the labour-saving benefits of ‘live-action’ are somewhat diminished. Last, as expressed in comments to Seth, another main objective of the project was to explore ‘under-camera’ or physical lighting for stop-motion production. This objective cannot be fully explored with a mixed medium, multi-dimensional approach (and the ‘problem’ of lighting across each dimension so that a pleasing cohesion is achieved scene-by-scene is far from trivial.) Best left to those with considerable professional experience in photography and/or film-making in both ‘real-life’ and ‘under-camera’ to my mind. It could very well be the case that what seems like a clever short-cut could be a open a real cans of worms rather quickly…. “Stick to the path, beware the moon!” might be a good rule of thumb at this production stage – well certainly for ‘The Bone House’, at any rate! 😉 Many thanks for your thoughts though, it is still valuable and important to consider all potential options, even if these aren’t ultimately adopted.